The author would appreciate a contribution, at least equal to the coffee you might enjoy while reading the column below, to help fund his ongoing work and pay for this site. Click on paypal.me/JonathanManthorpe to be taken to his personal PayPal page. It has taken 100 years for Britain to sink from being the world’s premier super power to the increasingly inconsequential cluster of off-shore European islands it is today. The slide into irrelevance has been slow and genteel, until the last few months, and especially since the debacle for the governing Conservatives in the June 9 election. The view from the White Cliffs of Dover is now of a vast and unwelcoming no-man’s-land. Britain’s long road to reality came to a bleak climax on Thursday and Friday this week. Britain’s Prime Minister, Theresa May, her political wounds still fresh and suppurating from her drubbing in the election two weeks ago, attended a summit of the 28 European Union leaders in Brussels. She wanted to talk about the fate of British subjects living and working in Europe, and European counterparts in Britain, once Brexit is achieved in about two years. Also on her list was what to do about Northern Ireland, which will suddenly have a hard border with the EU at the crossing points into the Irish Republic once the separation is complete. And then there’s the cost of the divorce. How many billions is Brussels going to demand in compensation from Britain for backing out of future obligations? Theresa May found, however, there is no interest among the 27 other EU leaders in talking to her about these things. For them, Brexit is a done deal. The details are for Eurocrats and whatever woefully inadequate team London manages to field – Whitehall is so bereft of experienced negotiators, the British government has been forced to bring in Canadians and New Zealanders on contract. “We hear different predictions, coming from different people, about the possible outcome of these negotiations: hard Brexit, soft Brexit or no deal. Some of my British friends have even asked me whether Brexit could be reversed, and whether I could imagine an outcome where the UK stays part of the EU. Tusk’s channelling of John Lennon has been widely interpreted as a sign that there is still an opportunity for the British government to change its mind, and to stay in the EU. That looks like wishful thinking. Tusk looked and sounded as though he was waffling because he had nothing to say. Indeed, Tusk moved on smoothly but speedily to say that the mood of optimism in the EU is now higher than it has been for a long time and that it is ready for the challenges ahead. 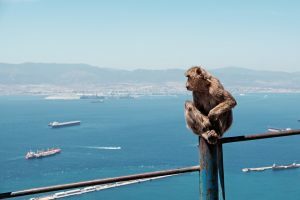 The EU has major issues to address, such as the continued pressure of migration from Africa and the Middle East, defence in the age of Donald Trump, and the economy, which is doing well with some notable exceptions like Greece. The EU also has a new and interesting generation of leaders – at least for the moment — who have surfaced since the British voters opted, by a slim margin in a referendum exactly a year ago, to leave the common market. There’s Emmanuel Macron in France and Leo Varadkar, the homosexual son of Indian immigrants, in Ireland. They embody commitment to European cohesion, the virtues of multi-culturalism, and the withering of old partisan establishments in the face of a renaissance in political thought. For many Europeans, and not just their leaders, Britain was always an unwilling and troublesome partner. There was much anger in Europe when former Conservative Prime Minister David Cameron called the referendum on EU membership last year, and even more when the British voted to leave. There was justifiable fear that Brexit would encourage “Eurosceptic” voters in other member states to demand their own referenda. But, having found in subsequent elections in Holland and France that Brexit is not an infectious disease spreading right-wing demagogy throughout the EU, most of the remaining members are happy to see Britain go. On the British side, the whole grim saga of Brexit is like an episode of Fawlty Towers, but without the jokes. It began with a raft of delusional Conservative backbench MPs yearning for a British Golden Age that never existed. They persuaded themselves, and convinced many of their constituents that silly, interfering bureaucrats and unelected EU pooh-bahs in Brussels were destroying the British – or, more precisely, the English – way of life with footling rules and regulations. Petty gripes took on a large swig of Basil Fawlty racism when the free movement of people and their families within the EU became a perceived problem. Free movement was enshrined in the Treaty of Maastricht in 1992, but at that time the EU was still just a club of western European nations. The full impact of the phasing out of internal borders wasn’t felt until the rule was extended under the 2004 Schengen agreement. And that coincided with the intake into the EU of 10 new members, most of them from the former Soviet East Europe bloc. The 10 are Cyprus, the Czech Republic, Estonia, Hungary, Latvia, Lithuania, Malta, Poland, Slovakia, and Slovenia. In a perverse way, it was to Britain’s credit that it became the preferred destination for very many Eastern Europeans seeking opportunity. But the arrival of plane, bus, and ferry loads of Manuels willing to work harder, and for less money, than the British sent the country’s Basil Fawltys into paroxysms of rage. Chief among them was Nigel Farage, leader of the United Kingdom Independence Party (UKIP) and the very epitome of the pub bore. But pub bores, if they are gloomy enough, have a way of attracting Eeyores. So it was with Farage. At the same time, globalization was gobbling up jobs and spitting them out in Asia and other low cost manufacturing centres. Farage’s tirades that it was all the fault of the bloody foreigners in Brussels found a ready audience. UKIP made something of a breakthrough in 2013 municipal elections, 2014 European elections and the 2015 general election for the Westminster parliament. In that election UKIP made its best showing ever when it won 12.6 per cent of the vote, but that translated into only one seat in parliament. Even though UKIP’s standing remained inconsequential, its progression out of the ranks of fringe parties scared a lot of the Conservative backbenchers. Some feared losing significant support to UKIP. Others, no doubt, were scared of UKIP because they agreed with its declaration that Britain’s problems stemmed from its membership of the EU. In an attempt to silence his rebels, Prime Minister Cameron promised ahead of the 2010 election that if elected he would oversee a referendum on Britain’s continued membership of the EU. It was a ploy to try to discipline his Eurosceptic backbenchers for the election campaign. But then he reneged on the promise, in large part because he had not won a majority and was in a formal alliance with the pro-Europe Liberal-Democrats. As the 2015 election approached, Cameron felt forced to renew his pledge, and said a referendum would be held in 2016 if the Conservatives won a majority, which they did. History will undoubtedly heap much blame on Cameron for the farce of the last two years. First, he should never have allowed himself to be bullied into calling a referendum. Referenda do not sit easily with the Westminster parliamentary style of government. This is based on the concept of electing MPs, who are expected to understand and reflect in parliament the views and concerns of their constituents. If the MP fails in this mandate, he or she is chucked out in the next election. Referenda, which circumvent the supremacy of parliament and ask voters to decide by a simple yes or no vote on complex and often far-reaching questions, are an alien approach. Referenda used by governments in the Westminster parliamentary system are usually a way out for political leaders who don’t have the guts or decisiveness to make up their minds about difficult issues. So it was with the Brexit referendum in June last year. On top of the sin of calling a referendum in the first place, Cameron then ran an appalling campaign, arguing with only tepid enthusiasm that the future for Britain is better inside the EU. Not only was the campaign feeble, Cameron and other political leaders, the Labour Party’s Jeremy Corbyn most prominent among them, failed to perceive how deeply anti-EU sentiments had taken hold among committed Tories in rural England and blue collar voters in traditional Labour Party strongholds. When the referendum results came in after the June 23 vote last year, it was Conservative country folk and abandoned rust belt workers in traditional Labour regions who pushed the results to 51.89 per cent in favour of leaving the EU and 48.11 per cent against. To his discredit, Cameron immediately left the field. He resigned both as Prime Minister and party leader almost as soon as the last ballot was counted. This helped entrench the view in Britain, which still holds in some quarters, that there had been a conclusive vote for Brexit and that democracy had spoken. That was not true. Voter turn-out was 72 per cent and was especially low among young Britons. Also, it was mainly voters in England that voted for Brexit, and their numbers overwhelmed those in Scotland, Northern Ireland and much of Wales who wanted to stay in the EU. With the swift departure of Cameron, events in the Conservative Party took on a surreal tone. It was evident to all that Boris Johnson, the Mayor of London who had just returned to the Commons in the 2015 election, lusted after the leader’s post. A well-known figure from his frequent appearance on television, his newspaper columns, and his penchant for politically incorrect buffoonery, Johnson had made himself the champion of the Brexit campaign, and now expected the pay-off. He was well-placed to win under the Tories’ system for choosing a leader. First, the parliamentary caucus, through a system of informal and backroom polls, picks two candidates, who are then put to a nation wide vote among party members to make the final choice. It looked to be a choice between Johnson and the pro-remain Theresa May. But then, at the last moment, one of Johnson’s most prominent supporters and backers, Michael Gove, decided that he wanted to be a candidate. There were a few hours of confusion before Johnson and Gove did the maths, realised they counted each other out, and both withdrew. Theresa May became Tory leader and Prime Minister by default. Despite her support for Britain remaining in the EU, May was seen as a safe pair of hands. Comparisons were made with Margaret Thatcher and cartoonists starting portraying May in a suit of armour, much as they had the Iron Lady 30 years ago. But cartoonists are often the most sensitive of social commentators, who spot trends and moods well ahead of others. It soon became noticeable that May’s suit of armour was not the Thatcherite pristine battlewear of St. George, but more the bashed and battered cast-offs of Don Quixote. May proclaimed that “Brexit means Brexit,” though what that meant was and continues to be a mystery. It also remained a mystery on what terms she wanted to leave the EU and what she wanted Britain’s post-Brexit relationship with Europe to be. There was much bandying around of the phrases “hard Brexit” and “soft Brexit,” though what these inferred about Britain’s departure from and future trade and other ties with Europe is difficult to say. A rough guide is that “hard Brexit” means Britain will entirely sever relations with the EU, and only then seek a new free trade agreement. “Soft Brexit” means Britain seeking to keep the existing free trade relationship with the other 27 countries, while jettisoning the things it doesn’t like about the EU, such as the ultimate sovereignty of the European Court and the free movement of people. Theresa May started off by advocating for a hard Brexit. But the calamities that have befallen her in the past year – most of them self-inflicted — have confiscated almost all her political authority. She is now plaintively asking for a soft Brexit, but will have to put up with whatever Brussels gives her. After taking office, May delayed starting the process of Britain leaving the EU, by triggering Article 50 of the Lisbon Treaty, until the end of March. Part of the delay was undoubtedly because the government came face to face with the difficult realty that Britain no longer had enough experienced trade and constitutional negotiators in its civil service to field a team in Brussels. In February a call went out from Whitehall asking Canada, Australia and New Zealand to please lend Britain some of their negotiators. Until the triggering of Article 50 there was some hope that May might follow her own preferences, and those of the majority of members of the House of Commons, and somehow reverse what was, after all, far from being an overwhelming vote to leave the EU. At the same time, public opinion in Britain did an about turn. It was now a slight majority who favoured staying in the EU and a minority still backing Brexit. There are a number of reasons for this, most of them the usual hangover in the cold light of dawn after a night of revelry. 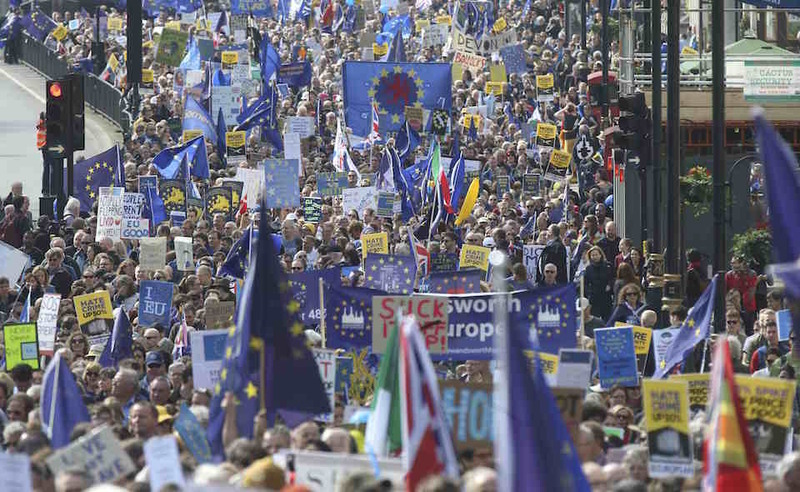 The campaign for Brexit a year ago contained a largely unspoken piece of wishful thinking that saw Britain’s departure from the EU as the moment when there would be a revival of the club of English-speaking nations. This dream envisaged an alliance of Britain, the United States, Canada, Australia and New Zealand against the world. It was only after the Brexit win, when the yearned-for alliance did not materialize, that Brexiteers began to see what a cold and unwelcoming world awaited their arrival. The current Canadian government is a firm believer in multilateral institutions and regional free trade agreements. It has just completed a major free trade agreement with the EU. Australia and New Zealand are similarly inclined and both, after much internal struggle, now self-identify as Asian nations. Former U.S. President Barack Obama was upfront in urging Britons to vote to remain in the EU, but the arrival of Donald Trump changed the equation. Many Brexiteers were cheered and heartened by Trump’s denigration of the EU and his support for the British, French and anyone else to quit the alliance. But once Trump became President it became obvious to even the most hidebound Brexiteer that Trump has no political philosophy or fixed convictions, and that he is motivated entirely by flim-flammery and whatever he thinks the crowd wants to hear. It was also clear that Trump has nothing but disdain for the UK, and any dreams in Britain of a revival of the trans-Atlantic “special relationship” is worse than fanciful. With the air heavy with confusion, Theresa May then made another appallingly bad decision. She chose to call a snap election, saying the country needed to demonstrate “strength and stability” by giving her a majority in the House of Commons and clear mandate to negotiate Brexit. Well, it is true that her political legitimacy was tenuous. She was Prime Minister and leader of the Conservative Party only because she was the only surviving candidate after Cameron resigned. But her timing was terrible, and she misread the mood of voters just as badly as Cameron had in 2016. To very many people, May’s calling of the election looked like a crass piece of opportunism. Polls indicated that the Labour Party and its leader Corbyn were unpopular beyond belief, and that May and the Tories could not only dramatically increase their majority, but even perhaps kill off the Labour Party as a political force for a generation. Voters didn’t like being taken advantage of by the Tories. More than that, many of them objected to May and her advisers trying to dictate the issue as them being given a strong hand with which to confront Brussels. During the course of the campaign the voters decided the issue they preferred was the whole question of austerity cuts in government spending under the Tories, and what this was doing to social services. Jeremy Corbyn during the course of the campaign transformed from a loonie leftie leftover from the 1960s, to a principled swan gliding majestically and calming the ruffled waters of British public life. Corbyn didn’t win, of course. However, he brought the Labour Party roaring back into contention and drove May and the Tories into minority. In order to continue governing she is now dependent on the support of the 10 members of the Democratic Unionist Party from Northern Ireland. These are not savoury or compatible bedfellows. DUP political philosophy, such as it is, is rooted in Protestant triumphalism over Catholics in Ireland in the 17th century. To say that the DUP is not housetrained in the social issues of the 21st century is to be excessively polite. That might be manageable for May and the Conservatives were not Northern Ireland a key issue in the Brexit negotiations. In 1998, at the end of the 30-year guerrilla and terrorist war launched by the Irish Republican Army in the 1960s to try to unify Northern Ireland with the Irish Republic, a central element in the Good Friday Agreement was the opening of the border between the two jurisdictions. This was eased by both Britain and the Irish Republic being members of the EU. But when Britain leaves the European community, customs and immigration barriers should go up again along the border between the two Irelands, with potentially serious consequences for the peace process. That process is already churning through dangerous seas with the collapse of a power sharing agreement between the republicans and unionists in the provincial government. Moreover, the revived border will be the only land link between Britain and the EU. It will be the place illegal migrants congregate in the hope of getting into Britain, as they do in the French port of Calais now. That’s assuming, of course, that after Brexit, Britain is still an attractive destination for refugees and migrants from Africa and the Middle East. In a speech this week, the Canadian governor of the Bank of England, Mark Carney, warned Britain is heading for difficult and uncertain times that will see weaker real incomes. He said that monetary policy implemented by the bank can go only so far to alleviate the impact of job losses and inflation that are likely to be part and parcel of the Brexit process. No head of the Bank of England in living memory has been the target of so much public criticism as Carney, who headed the Bank of Canada before taking over in London in 2013. 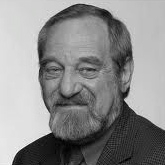 So his tilt at Johnson will probably be water off a duck’s back, as most criticisms of Johnson prove to be. The man is not known for his sensitivity. Johnson probably still wants May’s job and to be Prime Minister, but there is a lot of opposition to him within the party, and there seems to be a consensus among Tories that now is not the time to remove her. A comment by the former Chancellor of the Exchequer (finance minister), George Osborne, that May is a “dead woman walking,” looks to be off target. She has shown contrition for her failure in the election, and fired the advisers who pushed her along that path. This week she produced a legislative agenda for the new parliament that can draw widespread acceptance from both Tories and others in the House of Commons. Theresa May’s fate will turn on the progress and direction of the negotiations on Brexit. While it is not impossible that a putsch is attempted over the summer, the most likely scenario is that an assessment of her leadership will be made by Tory party members at the annual convention in October. If May survives that, there will probably be an inclination to let her carry on until Britain leaves the EU in March 2019 or thereabouts. By that point, it looks very much as though the leadership of Britain will be a grim and thankless inheritance. Jonathan Manthorpe is the author of “Forbidden Nation: A History of Taiwan.” Return to his column page. I have just been to see Her Majesty, the Queen and I will now form a government. A government that can provide certainty and lead Britain forward at this critical time for our country. This government will guide the country through the crucial Brexit talks that begin in just 10 days and to deliver on the will of the British people by taking the United Kingdom out of the European Union. It will work to keep our nation safe and secure by delivering the change that I set out following the appalling attacks in Manchester and London. Cracking down on the ideology of Islamist extremism and all those who support it. And giving the police and the authorities the powers they need to keep our country safe. The government I lead will put fairness and opportunity at the heart of everything we do. So that we will fulfil the promise of Brexit together and over the next five years build a country in which no one, and no community, is left behind. A country in which prosperity and opportunity are shared right across this United Kingdom. What the country needs more than ever is certainty. Having secured the largest number of votes and the greatest number of seats in the general election, it is clear that only the Conservative and Unionist party has the legitimacy and ability to provide that certainty by commanding a majority in the House of Commons. As we do, we will continue to work with our friends and allies in the Democratic Unionist Party in particular. Our two parties have enjoyed a strong relationship over many years and this gives me the confidence to believe that we will be able to work together in the interests of the whole United Kingdom. This will allow us to come together as a country and channel our energies towards a successful Brexit deal that works for everyone in this country, securing a new partnership with the EU which guarantees our long term prosperity. That’s what people voted for last June, that’s what we will deliver, now let’s get to work. 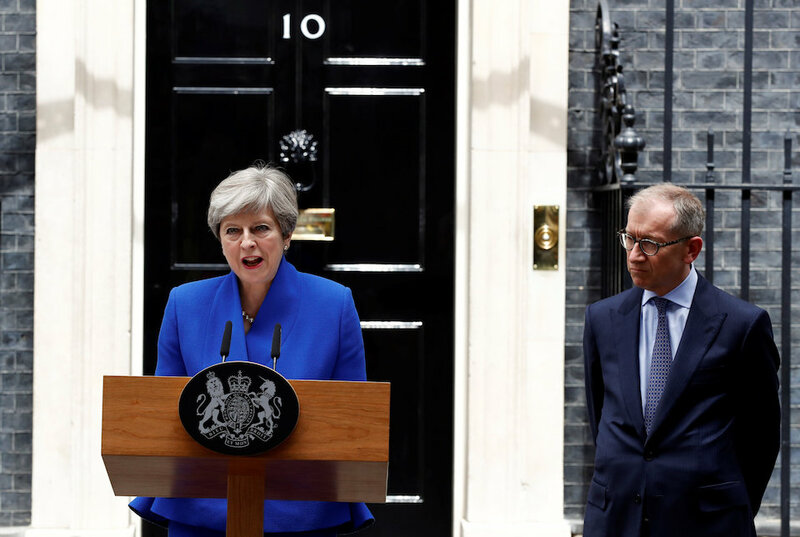 LONDON (Reuters) – British Prime Minister Theresa May lost her parliamentary majority on Friday after a surprisingly poor election performance, throwing her future into doubt. GENEVA (Reuters) – Britain’s new government would be well advised to ask for more time to negotiate Brexit, trade experts said on Friday, as Prime Minister Theresa May’s bid to strengthen her bargaining position through a quick election victory fell flat. Top trade lawyers at a conference in Geneva struggled to digest the election chaos, but said the vast amount of negotiating and the practical job of implementing a trade deal could not be done by the March, 2019 deadline. “Listening to all of this, the one thing that I am speculating on as I hear it all is the desperate need, I feel, to buy time,” said Jennifer Hillman, formerly an appeals judge at the World Trade Organization and legal counsel to the U.S. Trade Representative. May’s parliamentary majority was wiped out in a snap election she had called to strengthen her hand in Brexit talks, throwing Britain into political turmoil. “It strikes me there’s no way, no way at all, that this can be done in the two-year time frame, even leaving aside the outcome of the elections,” Hillman said, citing Britain’s lack of experienced negotiators and regulators as part of the problem. 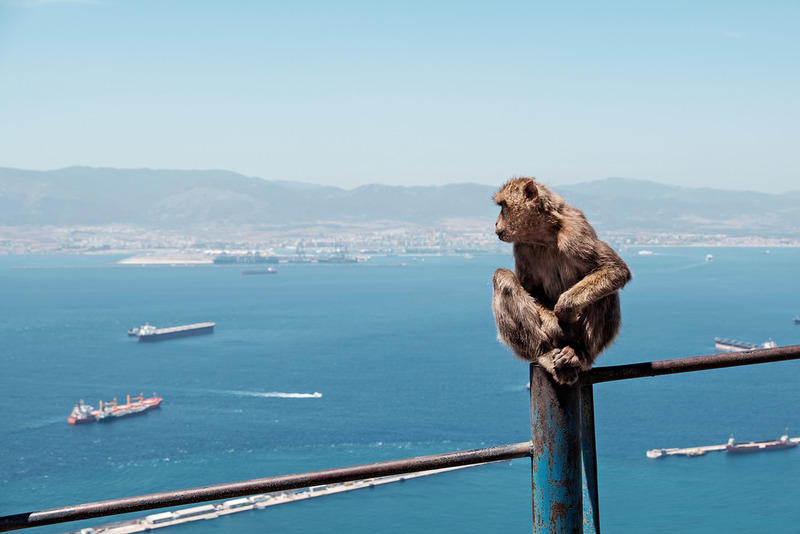 Veteran trade litigator Gary Horlick said every question about Brexit generated 10 more, and the need to replace thousands of existing agreements threw up vast practical and logistical issues, some of them relatively trivial. “Transition is quite possible but someone has to check every single thing,” he told the conference, held by the Geneva Graduate Institute and Georgetown University Law Center. “It’s really made for the KPMGs and PriceWaterHouses of the world. Holger Hestermeyer, an international dispute resolution expert at King’s College London who has advised a committee of Britain’s House of Lords on Brexit, said May had been wrong to think she needed a big majority in parliament to negotiate with the EU, and now faced a “very, very tough” situation. “More time is needed,” he said. “The two years is the transition period. If we would now have a transition period industry could rely on that. But they already have to plan for the worst-case scenario. That time frame is just not enough. I thing prolonging it is possible. Isabelle Van Damme, a trade lawyer at Van Bael & Bellis who previously worked in chambers at the European Court of Justice, agreed. “I think an extension is absolutely needed but it needs to be asked now and I don’t think there is political capital to do that right now in the United Kingdom,” she said. LONDON (Reuters) – British Prime Minister Theresa May said she would lead a minority government backed by a small Northern Irish party after she lost an election gamble days before the start of talks on Britain’s departure from the European Union. May called the snap election confident her Conservative Party would increase its majority and strengthen her hand in the Brexit talks. Instead, Thursday’s vote damaged her authority and made her negotiating position more vulnerable to criticism. 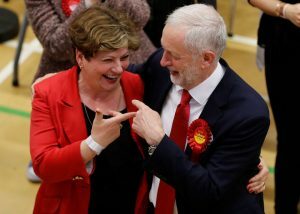 “I’m sorry for all those candidates and hard working party workers who weren’t successful,” May said on Friday after a surprise resurgence by the main opposition Labour Party under its leftwing leader Jeremy Corbyn. With 649 of 650 seats declared, the Conservatives had won 318 seats, the Labour Party had 261 seats, followed by the pro-independence Scottish National Party on 34. May now risks more opposition to her Brexit plans from inside and outside her party, though a party source said the leading the Conservatives was seen as too much of a poisoned chalice for her to face an immediate challenge. “She’s staying, for now,” the source told Reuters. 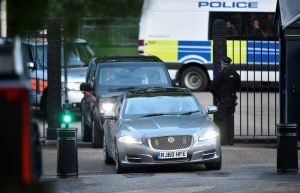 Just after noon, May was driven the short distance from her official Downing Street residence to Buckingham Palace to ask Queen Elizabeth for permission to form a government – a formality under the British system. Her office said later that the key finance, foreign, Brexit, interior and defence ministers would remain unchanged. Further announcements were expected on Saturday. The socially conservative, pro-Brexit Democratic Unionist Party’s 10 seats are enough to give the right-wing Conservatives a fragile but workable majority, which May said would allow her to negotiate a successful exit from the EU. “Our two parties have enjoyed a strong relationship over many years and this gives me the confidence to believe that we will be able to work together in the interests of the whole United Kingdom,” May said. It was not immediately clear what the DUP’s demands might be and one DUP lawmaker suggested support might come vote by vote. British business, already struggling with the uncertainties of the two-year Brexit negotiating process, urged party leaders to work together. “The last thing business leaders need is a parliament in paralysis, and the consequences for British businesses and for the UK as an investment destination would be severe,” said Stephen Martin, director general of the Institute of Directors business lobby. May said Brexit talks would begin on June 19 as scheduled, though the election result meant it was unclear whether her plan to take Britain out of the bloc’s single market and customs union could still be pursued. EU leaders expressed fears that May’s shock loss of her majority would raise the risk of negotiations failing. “Do your best to avoid a ‘no deal’ as result of ‘no negotiations’,” Donald Tusk, leader of the EU’s ruling council, wrote in a tweet. There was little sympathy for May from some Europeans. “Yet another own goal, after Cameron now May, will make already complex negotiations even more complicated,” tweeted Guy Verhofstadt, the former Belgian premier who is the European Parliament’s point man for the Brexit process. May’s predecessor David Cameron sought to silence eurosceptic fellow Conservatives by calling the referendum on EU membership, expecting Britons to vote to remain. The result ended his career and shocked Europe. Norwegian Foreign Minister Boerge Brende said the election outcome could mean a less radical split between Britain and the EU. Ruth Davidson, leader of Conservatives in Scotland, where the party did well, said the results showed that the Conservatives should prioritise good trade relations with the European Union. “We must in my view seek to deliver an open Brexit, not a closed one, which puts our country’s economic growth first,” Davidson said. Other Conservatives have emphasised the importance of migration controls, something the EU says is incompatible with open trade. Labour’s Corbyn, revelling in a storming campaign trail performance after pundits had pronounced his Labour Party all but dead, said May should step down and that he wanted to form a minority government. May unexpectedly called the snap election seven weeks ago, three years early, polls predicting she would massively increase the slim majority she had inherited from Cameron. 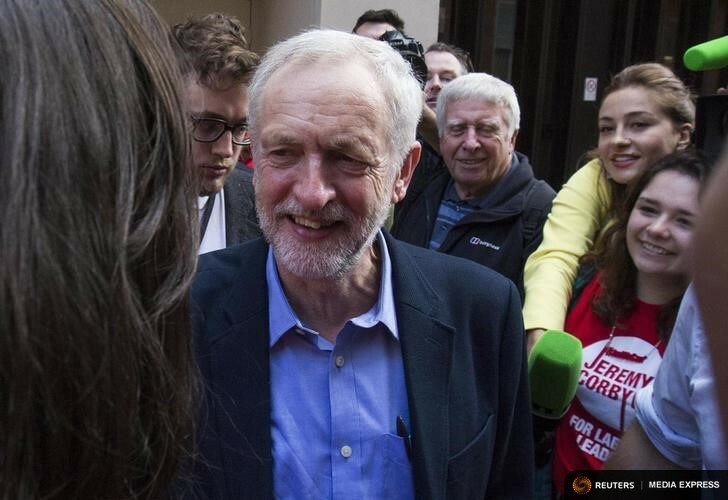 Her campaign unravelled after a policy U-turn on care for the elderly, while Corbyn’s old-school socialist platform and more impassioned campaigning style won wider support than anyone had foreseen, notably from young voters, say analysts. Late in the campaign, Britain was hit by two Islamist militant attacks that killed 30 people in Manchester and London, temporarily shifting the focus onto security issues. British voters have shown Prime Minister Theresa May the door. Her gamble to call an early election in the expectation of strengthening her Conservative majority in parliament – and thus her clout in upcoming negotiations on the United Kingdom leaving the European Union – failed dramatically. 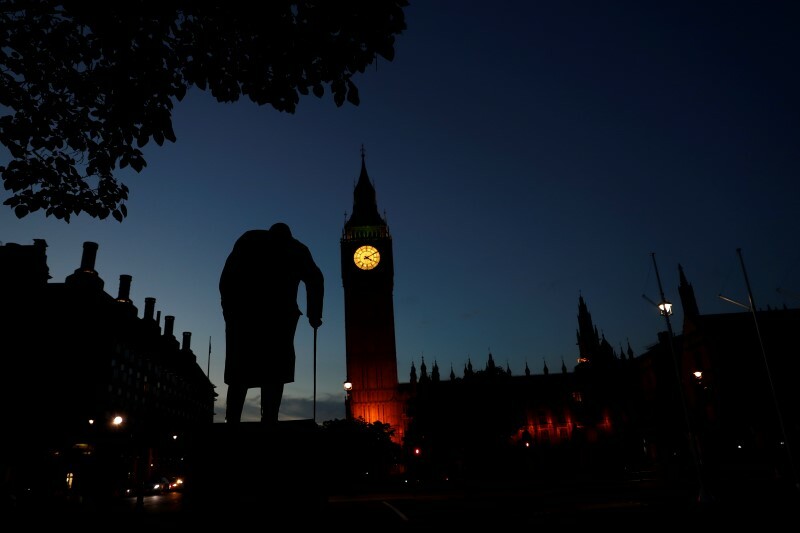 When the final votes were tallied in the dawn hours of Friday morning the Tories were reduced to a minority of 319 seats in the 650-seat house. May said on Friday she will seek to continue in government, probably with the support of the 10 elected members of the Northern Irish Democratic Unionist Party, traditional allies of the Tories. The implications of this drubbing for the Conservative government are profound. For May herself, the writing is on the wall. If she does not choose to quit the party leadership and premiership herself, it is a matter of months at the most before the Tory caucus settles on a slate of candidates to supplant her. For Britain, the results have much deeper implications. The Westminster government is due to start talks in 10 days time with Brussels on the terms of departure from the EU. Key issues are how much Britain is forced to repay the EU in exit fees, what transitional arrangements will be put in place during the two to three years of the exit process, and what, if any, agreements can be reached on future free-trade arrangements. The election result has weakened dramatically the bargaining position of the British negotiators. Whether the process can keep to the envisaged two-to-three year exit time table and how painful the extraction is now heavily dependant on the generosity, if any is on offer, of the remaining 27 EU members. May, much to the chagrin of many Tories, called an unnecessary snap election, and she has paid the price. Corbyn proved to be an effective campaigner, especially among young voters. Labour produced a manifesto that spoke to widespread disenchantment among voters at the grinding austerity measures pursued by successive Conservative governments. There was also a common determination among people who voted in last year’s referendum against leaving the EU. In that vote, 52 per cent voted to leave and 48 per cent remain. Among those remainers is widespread belief and anger that they have been forgotten as the exit process starts. They are upset that Theresa May has opted for a so-called “hard Brexit.” This appears to mean no attempts would be made to forge agreements with Brussels on such things as migration, easy movement of labour and free trade before Britain leaves. In tandem with that is anger that the May government has been secretive about its plans and details of the current talks with Brussels. If the Conservatives hang on to government, the whole atmosphere around the dealings with Brussels will change. The Labour Party is going to have much more influence on the process, simply because of its added authority in the House of Commons. This is likely to result in much more open debate about the negotiations and negotiating positions as they go along. The election was clearly a referendum on Theresa May’s leadership, but it was also a reaction to last year’s “Brexit” referendum. Both the Conservatives and Labour picked up notably larger numbers of votes than they did in the last general election in 2015. But Labour picked up many more than the Tories, and this translated into 26 more seats. A major factor in both parties’ growth in support was the virtual disappearance of the United Kingdom Independence Party, whose highly effective campaigning against the EU spooked former Tory prime minister David Cameron to call the referendum last year. It had been expected that the Tories would gain most from the disappearance of Ukip. However, in Britain’s rust belt, the ravaged old industrial areas of the Midlands and northern England, many traditional Labour voters opted for Brexit in the referendum, believing that free immigration under the EU had robbed them of their jobs. With Ukip gone, these people returned to the traditional Labour Party loyalty. Also, many young people who neglected to vote in the referendum and who felt cheated out of their future by the decision to leave the EU, came out to vote this time. They seem to have gone mainly for Labour. A notable sidebar to the election was the near collapse of the Scottish National Party. It lost 21 seats, with the Conservatives picking up 12, Labour six and the Liberal Democrats three. In the referendum Scotland voted heavily to remain in the EU, and the victory for Brexit led SNP leader Nicola Sturgeon to demand another vote on Scottish independence. With this result, the prospects of another independence referendum for Scotland have disappeared, for the moment. The Conservatives now have a major problem picking likely candidates to succeed Theresa May. Several high-profile ministers lost their seats in Thursday’s election and there are thus four names on the slate at the moment. There’s the Home Secretary Amber Rudd, who performed well in the campaign, particularly in TV debates. David Davis, the minister responsible for negotiating Brexit, is another. Then there’s the Defence Minister Michael Fallon, who is a smooth performer, but perhaps a bit too smooth. Finally, there is Foreign Secretary Boris Johnson, who campaigned for Brexit, and who could probably have won the leadership in the wake of Cameron’s resignation last year had he stood. Far from bringing stability and certainty to the British political scene and the Brexit process, this election has produced massive uncertainty. Not least of those questions is who will be Prime Minister in a few weeks or months time. Six weeks ago, when Britain’s Prime Minister Theresa May called a snap election, it seemed a foregone conclusion this was simply a formality to boost her parliamentary majority and strengthen her hand in negotiating Brexit from the European Union. Not any more. The smell in the air now is that May and her Conservative Party will, at best, lose seats in the June 8 election. They might be pushed into a minority and depend for survival on deals with minor parties. 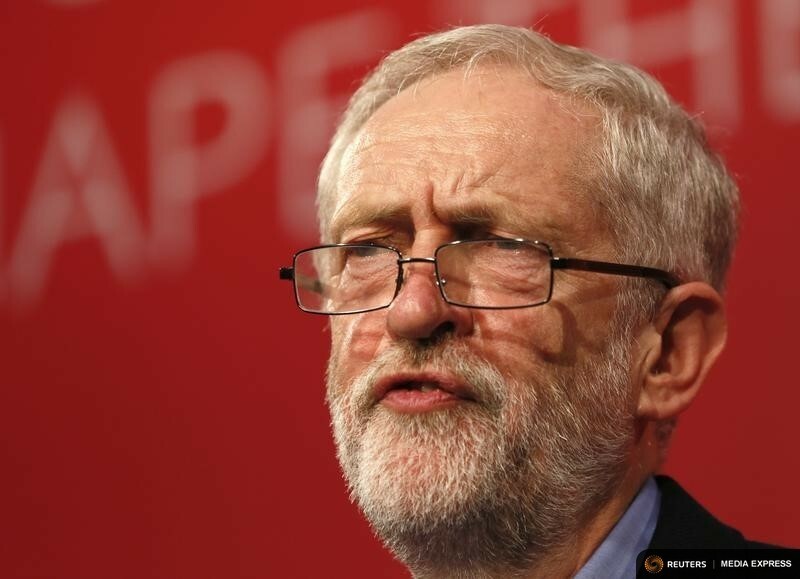 There are even pundits and analysts musing that Jeremy Corbyn, the much-derided leader of the main opposition Labour Party, could end up the Prime Minister leading a minority government. Pollsters are being properly cautious after a series of dramatic misreadings of electorates in recent years – including Britain’s Brexit referendum last June on leaving the EU, and the eruption of Donald Trump in the United States. But, for what they are worth, the polls in Britain are showing that May’s 20-point lead at the start of the campaign has dwindled to almost nothing. An Ipsos MORI poll published on Friday shows the Conservatives with 45 per cent support, Labour with 40 per cent, and the Liberal Democrats, the perennial bridesmaid of British politics, with only 7 per cent. The United Kingdom Independence Party (UKIP), whose eating away at Conservative Party support over the EU membership issue pushed former Prime Minister David Cameron to gamble and lose on the referendum last June, has disappeared without trace. With variations of a point or two here and there, all the other polls paint a similar picture – May is set to lose seats and might be forced into minority. More compelling than the polls, however, in suggesting a Tory comeuppance is the drama of the campaign itself. Or rather, the astonishing lack of drama. Given the closeness of the referendum result last year, with only 52 voting in favour of leaving the EU and 48 per cent wanting to remain, this election was widely expected to be a rerun of Brexit, especially as May was not herself in favour of quitting the union. May’s reluctance to brandish Brexit is because most Brexit supporters, including the most voluble elements in her Tory party, consider the 2016 referendum the final democratic word on the matter. Also, many who voted to remain have come around to at least acquiesce to Brexit, lulled, perhaps, by the failure of the British economy to immediately implode, as banking and commercial interests predicted. Corbyn and the Labour Party have been equally hesitant to grasp the Brexit nettle. The party opposed leaving the EU, and is uncomfortably aware that over much of the country it was traditional Labour supporters, feeling themselves, like Donald Trump’s Appalachian coal miners, the victims of immigration and free trade, who assured the Brexit victory. Corbyn, the unreconstructed 1960s socialist, has thus been free to play the role in which he feels most at home. He has been stomping the country and ranting to increasingly large rallies about the iniquities of Conservative austerity policies, and the bounty that a Labour government would heap on Britain’s struggling social services. 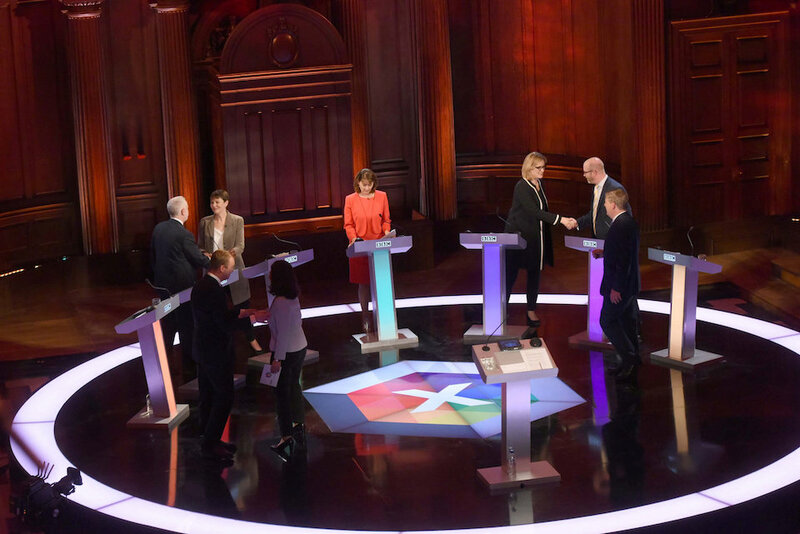 Corbyn also performed well in the televised TV debate this week. May did herself no good by boycotting the debate and sending her Home Secretary, Amber Rudd, as a surrogate. Corbyn comes across less and less like the unelectable loony lefty of his media caricature. This will dismay centrist members of the Labour Party, especially in the parliamentary caucus. They had hoped that a disastrous election result would allow them to get rid of Corbyn, who was foisted on them through the rabid democracy of an on-line ballot of grass roots party members. However, there is an undertow in the tide that appears to be flowing in Corbyn’s direction. His growing support is primarily among the young. The Economist magazine has reported that Labour’s support among young voters has risen from an average of 43 per cent when the election was called in April to 57 per cent now. The problem for Corbyn is that younger voters are far less likely to actually go to the polls than are their parents’ generation. And among older, dedicated voters Labour’s support has grown by only four points to 19 per cent. Theresa May is one of those unfortunate politicians whom voters admire and respect from a distance, but who suffers on close inspection. There was a sense of relief that the country was in safe hands when she became Conservative leader and Prime Minister by default last summer. Cameron resigned government and party leadership after his Brexit defeat, and then the candidates to succeed him managed to knife each other in the back. May was the last person standing. Until her unexpected announcement in April, she had been dead set against calling an election, even though she had no clear mandate either as Tory party leader or Prime Minister. What caused her to change her mind and call the snap election is still a matter of debate. The most widely accepted explanation is that the double-digit Conservative lead in the polls and the apparent unelectability of Corbyn at the head of a widely divided Labour Party offered a strategic opportunity. She may believe it would be useful to have the clear backing of the British people heading into brutal negotiations with the EU. Brussels is making it abundantly clear that it intends to make Brexit as painful and expensive as possible. Britain will be the first of the EU’s 28 members to quit, and Brussels wants to show other countries that might be thinking of heading for the exit that it would be a nasty and agonising experience. However, May and her political advisers appear to have deluded themselves into thinking the snap election campaign would be a walk in the park with victory, probably with an even larger parliamentary majority, as the inevitable outcome. Perhaps for that reason they didn’t put much effort into planning a proper campaign or producing a convincing manifesto. The platform is long on rhetoric and short on specific proposals. And early on in the campaign one specific plan proved disastrous. A proposed program would have made the elderly pay for care in their own homes if they had assets worth more than the equivalent of $174,000. As Britain has experienced the same relentless surge in real estate prices as elsewhere, this raised the prospect that the average elderly Briton would have to sell their homes to pay for their care. The Labour Party pounced, called the move a “dementia tax,” and the Conservatives swiftly withdrew the proposal. This incident served to arouse the suspicion that always lurks near the surface among many British voters that the Tories are the “nasty party.” It didn’t help that, on closer inspection, May’s managerial competence came bundled with a personality that appears detached, cold and aloof. Like Margaret Thatcher, with whom she is often compared, May’s public persona lacks warmth. But May also lacks passion, and no one could ever accuse Maggie Thatcher of that. In politics the plot lines of the individual players is always entertaining, but in this case there is the far more important question of what effect an inconclusive election result will have on the Brexit negotiations. Britain had a weak hand from the start, and all the likely outcomes of Thursday’s election will make it worse. More than that, events elsewhere are compounding London’s feebleness. Immediately after the vote for Brexit there was much confident bluster that the EU couldn’t afford not to sign a post-exit free trade agreement with Britain. That is now off the table. Brussels and EU leaders have been explicit that talks on a new trade deal can’t start until after Britain has left in two years or so, and that London can’t expect to have as open a relationship with Europe as it has now. Also, post-Brexit there was cheery waving across the Atlantic and enthusiastic predictions of a revived age of Anglo-American partnership. Well, the swift collapse of the Trump regime into dysfunction and the prospects of prolonged political malaise in the U.S. has cooled that ardour. There is added pungency to the bad smell about U.S. links in reports that the Federal Bureau of Investigation (FBI) has chalked up former UKIP leader Nigel Farage as a “person of interest” in the inquiry into the links between Russia and the Trump campaign. Farage has a strong personal relationship with Trump and both men are outspoken admirers of Russian autocrat Vladimir Putin. What seems to have put Farage in the FBI’s frame is his contacts with Wikileaks boss Julian Assange, who is holed up in the Ecuadorean embassy in London. Wikileaks, it will be remembered, was the vehicle for publishing embarrassing emails from the campaign of Democratic Party candidate Hillary Clinton, emails apparently pilfered by Russian hackers. At the same time, there has been a significant change in the whole atmosphere around the EU. When Britons went to the referendum polls a year ago its appeared the EU was stumbling towards collapse. The crisis over the common currency, the euro, continued and there seemed no end in sight for the economic turmoil in Greece, Portugal, Spain and Italy. Meanwhile, the anti-globalization demagogy – called “populism” – that produced Trump in the U.S. had similar outbreaks in Holland, France, Poland, Hungary and elsewhere in Europe. Those outbreaks have been quelled, at least for the moment, with the defeat of far-right movements in elections in Holland and France. And not only did the French electorate last month defeat Marine Le Pen and her National Front, they produced as President neophyte Emmanuel Macron. It is early days, but in his first appearances as President, Macron appears vigorous and courageous. 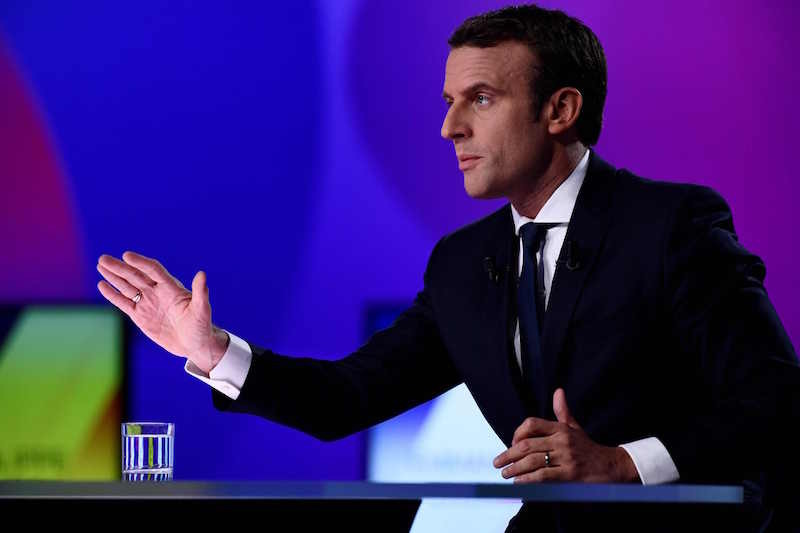 This week he publicly called out Putin to his face over Russia’s attempts to manipulate the French elections and its support for chemical weapons attacks on civilians in Syria. Macron has also been up front in his disdain for Trump, and even made televised statements calling on climate scientists and others to come to France, where they will be welcomed, if they find they are unappreciated or sidelined at home in America. Macron has also planted his flag as a reliable supporter of German Chancellor Angela Merkel in guiding the EU through its problems, and in broader issues like the 2015 Paris accord on combating climate change. For the last few months Merkel has seemed the lonely surviving champion of North Atlantic civic values. No longer. From seeming to be the Sick Man of the North Atlantic a few months ago, Europe suddenly looks like the future, especially in concert with emerging powers such as China and India. A few days, leave alone a week, are a long time in politics. So much can happen before British voters go to the polls on Thursday. But at the moment it looks as though the result will be a dispiriting muddle, the very opposite of the bright new dawn the Brexiteers hoped for. As the creator of what has come to be known as Corbynomics, my ideas on what is now known as People’s Quantitative Easing, progressive taxation, tackling the tax gap and other matters caused quite a stir in Britain’s 2015 Labour leadership race. They are all policies that, in my opinion, are at the core of tackling the austerity narrative. It is becoming clearer just how wrenching a process it will be for Britain to leave the European Union, and beyond doubt that Britain is headed for a “hard” Brexit. By triggering Article 50 to start Britain’s process of exiting the European Union, Prime Minister Theresa May launched the country into the unknown. 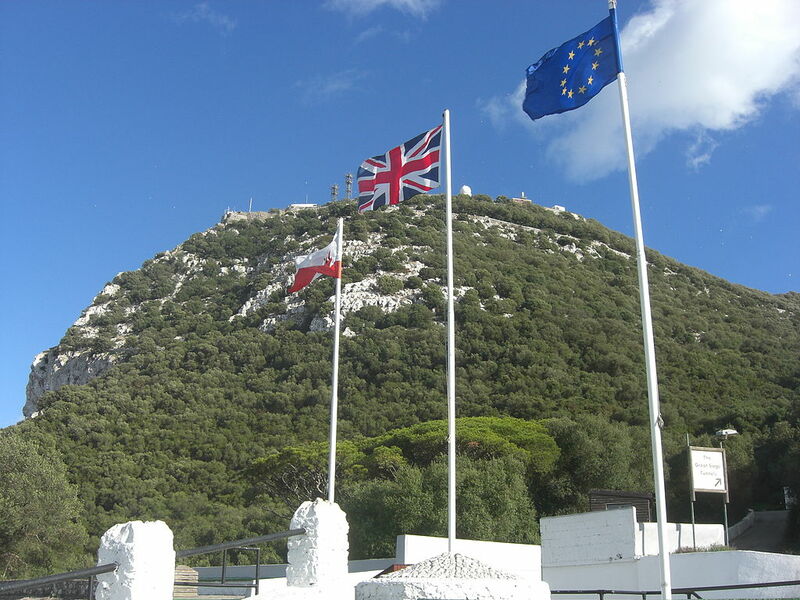 History provides examples of Britain leaving Europe – and sometimes Europe leaving Britain – that help give some perspective on the events that are about to unfold. The clearest lesson of all is that the European mainland has been essential to Britain’s prosperity, and that when the relationship with Europe is poor, the lot of the ordinary Briton is poorer for it. The United Kingdom is four nations in one, and was forged in the Middle Ages by war and blood as the English rulers sought to dominate their neighbours and to take from them their lands and resources. Wales effectively ceased to exist as a place of independence by 1283. 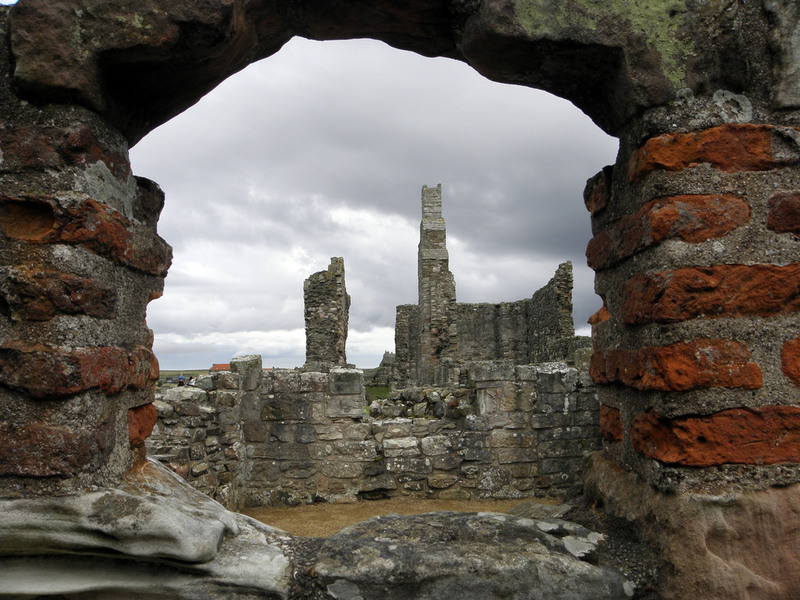 Scotland survived independently, but at enormous cost in life, land, and resources, and Ireland was squashed beneath the heal of the oppressor. 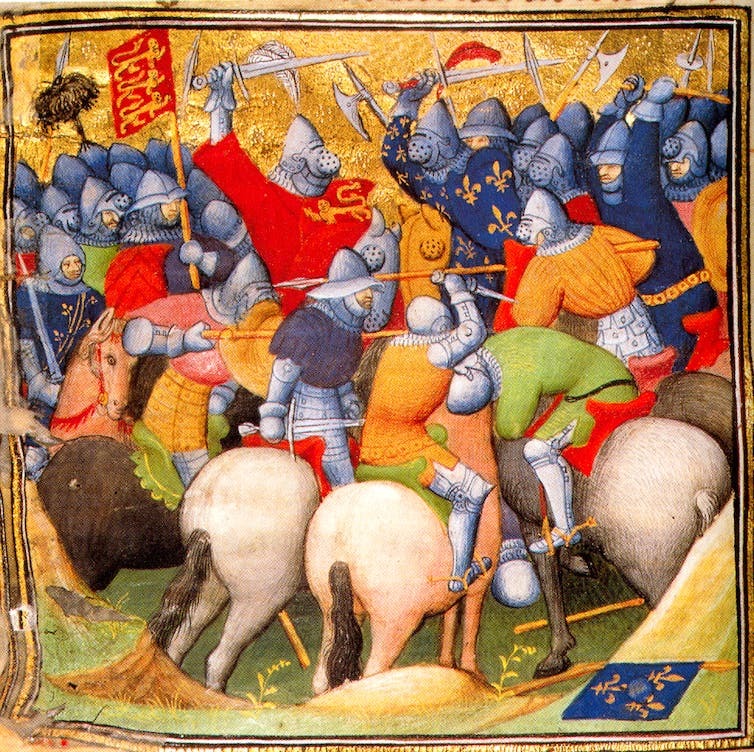 The 1346 Battle of Crécy during the Hundred Years’ War. Stephen Church is a Professor of Medieval History, School of History, University of East Anglia. This article was originally published on The Conversation. Read the original article. ROME (Reuters) – Europeans must contain their squabbling and carping about the EU if the Union is to survive, leaders warned on Saturday as they marked the 60th anniversary of its founding in Rome by signing a formal declaration of unity. 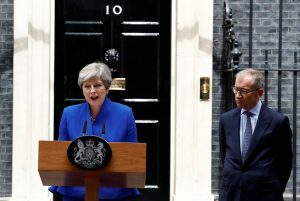 Four days before Prime Minister Theresa May, absent from the ceremony in the Italian capital, delivers an unprecedented blow to the bloc’s growth by filing Britain’s formal exit papers, her fellow leaders hailed 60 years of peace and prosperity and pledged to deepen a unity frayed by regional and global crises. But days of wrangling about the wording of a 1,000-word Rome Declaration, May’s impending Brexit confirmation and tens of thousands of protesters gathering beyond the tight police cordon around the Campidoglio palace offered a more sober reminder of the challenges of holding the 27 nations to a common course. “We have stopped in our tracks and this has caused a crisis of rejection by public opinion,” said their host, Italian Prime Minister Paolo Gentiloni, noting Britons’ repudiation of the EU. He said the failure to push the project forward during a decade of economic slump had fuelled a re-emergence of “blinkered nationalism”. Rome offered a fresh start: “The Union is starting up again … and has a vision for the next 10 years,” he said. Others, however, are wary of such enthusiasm for giving up more national sovereignty — and also of others in the Union moving faster with integration. Poland’s nationalist government has led protests against a “multispeed Europe”, which it fears would consign the poor ex-communist east to second-class status. 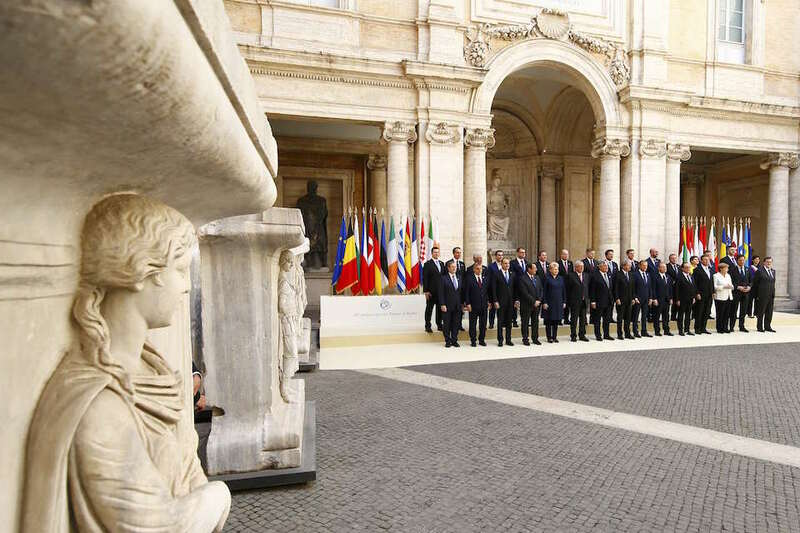 Leaders hailed the visionary “war generation” of leaders from old foes France and Germany who signed the Treaty of Rome in the same room on March 25, 1957, along with Italy, Belgium, Luxembourg and the Netherlands; some offered personal memories of their own generation’s debts to the expanding European Union. Jean-Claude Juncker, the EU chief executive, recalled how his father in Luxembourg was forced into the German army in World War Two; Donald Tusk, the summit chair born in Gdansk a month after the Treaty was signed, remembered growing up in the ruins of war and yearning for freedom behind the Iron Curtain. “That really was a two-speed Europe,” he said in a pointed dig at his domestic foes now ruling in Warsaw, who have tried to block a push by the western powers to deepen their integration. 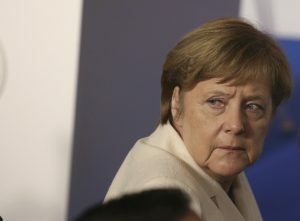 German Chancellor Angela Merkel, the bloc’s dominant leader who faces a re-election test in September, stressed the Union must also address the complaints of generations for whom war is fading into history. “We will in the future have to concern ourselves above all with the issue of jobs,” she told reporters. 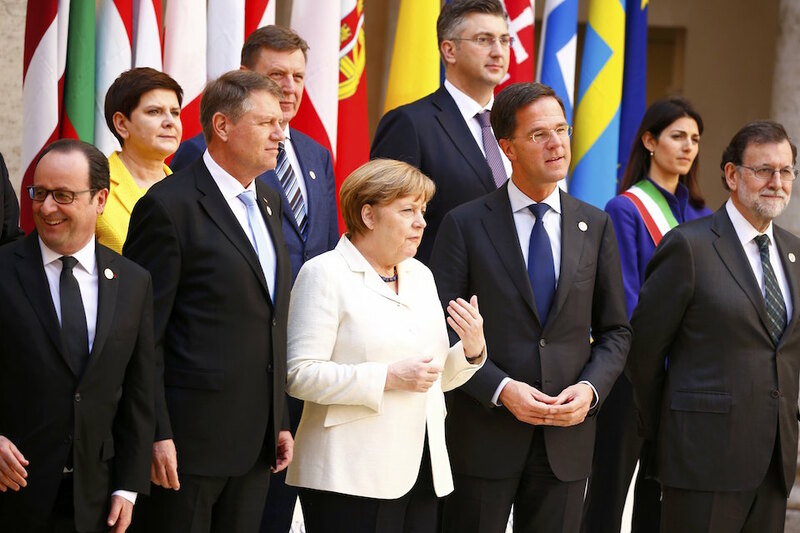 Fearing that the departure of its second-biggest economy and major global power could prompt the unravelling of the bloc, many leaders argue that only forward motion can revive popular support for the EU by generating economic and security benefits. “Today we renew our vows and reaffirm our commitment to an undivided and indivisible Union,” Juncker told them, urging the bloc not to get bogged down in details that alienated voters. Tusk, too, warned against the impression the EU was about petty regulations: “Why should we lose our trust in the purpose of unity today? Is it only because it has become our reality? Or because we have become bored or tired of it?” he asked. Merkel said leaders wanted to respond to people’s concerns, about the economy, welfare, migration and defence with “a protective Europe” that offered assurances on their wellbeing. They promised to listen to citizens. But locked away behind rings of armed police, the leaders may hear little of what thousands of protesters have to say on Saturday. Addressing right-wing supporters of the Fratelli d’Italia movement, its leader Giorgia Meloni denounced a “great EU deception”. “The real enemies of Europe,” she said, “Are the bankers, usurers and technocrats.” The Union, she added, must be replaced by a new alliance of “free and sovereign countries”. In these times of seething rage, it is increasingly likely that Britain’s divorce from the European Union will lead to the break-up of the United Kingdom itself. As the parliament in Westminster completes the process of giving Prime Minister, Theresa May, authority to start the process of taking Britain out of the European Union, anger and resentment is intensifying in Scotland and in Northern Ireland. These glimpses of the road ahead have prompted the First Minister of Scotland’s regional government, Nicola Sturgeon, to say it is “highly likely” she will seek another referendum on Scottish independence. In the first referendum in 2014, Scottish voters decided by a narrow margin to remain in the United Kingdom, not least because that seemed at the time the best option for Scotland to stay in the EU. That equation collapsed when the overriding majority of disenchanted blue collar English voters chose Brexit in last June’s referendum. The situation is particularly fraught in Northern Ireland, where Brexit could wreck the 1998 Good Friday Agreement, aimed at ending over 30 years of sectarian violence between British loyalist Protestants and Irish republican Catholics. An essential element in the confidence-building of the 1998 pact is the open border between Ulster and the Irish republic to the south under the umbrella of the EU. The re-imposition of a “hard” border between Northern Ireland and Eire will affect progress in demolishing community barriers. Northern Ireland’s economy will also be far more adversely affected by Brexit than other parts of Britain because of its dependence on EU agricultural subsidies. And there will be domestic political pressure on the Dublin government to interfere in Northern Irish affairs, thus likely inflaming the passions of Protestant Ulster loyalists. The peace agreement is already tottering, with the collapse on January 16 of the province’s power-sharing executive joining the loyalist Democratic Unionist Party and the republican Sinn Fein. New elections were held on Friday, March 3, but early returns suggest there will be no clear result, and London may have to impose direct rule. That will set back the development of devolved self-government in Northern Ireland. Prolonged direct rule by London could well see the province stripped of the moderate political actors who have begun to mature during the two decades of peace. Unlike in Scotland, however, there is no clear path by which Northern Ireland could maintain its desired relationship with the EU by, for example, opting to leave the UK and join the Irish Republic. Sturgeon will set out her argument for a new Scottish independence referendum when she addresses her party’s annual meeting later this month. From what she has said and written already, it is evident Sturgeon will make at least three arguments. It is unarguable that the June Brexit referendum result was just such a material change in circumstance. Another argument is that Sturgeon claims Prime Minister May has not fulfilled her promise to only start the process of taking Britain out of the EU once a common approach had been agreed with the British regional governments in Scotland, Wales and Northern Ireland. Also, her party’s voter mandate includes a clear responsibility to keep Scotland within the EU, Sturgeon has said. “There are various ways in which Scotland’s place in the European Single Market could be maintained,” she wrote in a recent discussion paper. 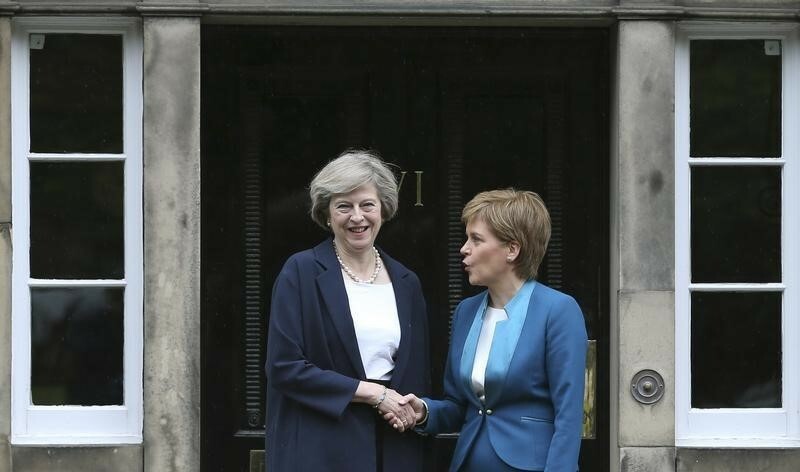 It will be difficult for Theresa May to refuse to give the Scottish Parliament permission to hold another independence referendum. But the British Prime Minister is likely to insist that no referendum be held before the UK has left the EU. May doesn’t want to be campaigning in Scotland while she is battling out the future with Brussels. The negotiations to take Britain out of the EU after 45 years as a member will take at least two years. That means no new referendum on Scottish independence will be held before 2019, and probably later than that. The European world may well be a different place by that time. With anti-Brussels parties gaining significant influence throughout the EU, and conceivably taking power in Holland, France and Italy this year, the union could be a very different beast, and perhaps even a dead one, by the time the Scots get to vote again on independence. Even if a new referendum were held now, it is touch-and-go whether Scots would opt to leave the UK. While 60 per cent of Scots opted to stay in the EU in the Brexit referendum, polls suggest they are not as committed to leaving the United Kingdom in order to stick with Europe. Recent public opinion surveys suggest there has been little change in public attitude since 2014, when 55 per cent of Scots decided to stay in the UK. The economic arguments for Scotland to remain in the UK are compelling. But as we know from the Brexit vote itself, and tribal nationalist convulsions that are consuming the United States, Holland, France and elsewhere, measured economic judgements are not always voters’ main consideration. First Minister Sturgeon counters this argument by warning that Scotland faces tough economic times anyway, that the fall-out from Brexit will be as damaging to Scotland as the necessary austerities of the first years of independence. “The case for full self-government ultimately transcends the issues of Brexit, of oil, of national wealth and balance sheets and of passing political fads and trends,” Sturgeon said recently. And in this age of demagogy and resurgent tribal nationalism who is to say she is wrong? In its independence referendum, Scotland voted to remain in the United Kingdom by 55 versus 45 per cent. An expert panel looks at what happened, and where it leaves the UK and Scotland. 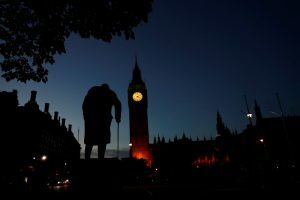 When the dust of history settles, the moment angry Britons voted to quit the European Union will stand out as the moment that saved the 28-nation project. Britain’s departure from the EU will be a journey across new territory full of terrors and treacherous terrain. Among the many stupidities in Cameron’s management of the referendum was allowing a simple majority for victory.